The hosts are toiling at home, with a 2-3 record at home from their overall 5-5 record so they may not be 100% looking forward to this game. However, the only chance to improve is by winning games and when you have a game against a side with a 2-8 record, you have to fancy your chances. The Germans head to Israel on Wednesday night in this Euroleague clash and both teams will have slight fears about the game. Maccabi know that they haven’t thrilled their fans at the Menora Mivtachim Arena too many times this season but this is a genuine chance to get their supporters off their seat and fully behind the side. Andrew Goudelock has been in fantastic form so far this season and he has managed an average of 16 points per game, which is a big reason in why Maccabi will have hope in this game. There has also been decent form from Devin Smith who has managed an average of 14 points per game while Sonny Weems has chipped in with an average of 13.4 points per game. 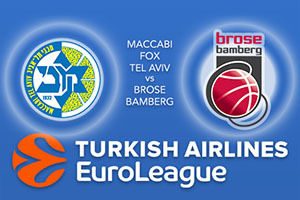 Brose Bamberg are currently at the bottom of the Euroleague and they are yet to grab a win on the road. They have been close a couple of times and they may feel as though this is the game to get them started. Darius Miller has been the key player for Brose Bamberg so far this season with an average of 13.5 points per game but he hasn’t been the only player making a difference. This is because Nicolo Melli has been in decent form and with an average of 12.5 points per game and an average of 7.7 rebounds per game, there are players in the Bamberg side that can have an impact. The hosts haven’t had a great time of it of late but they are looking in better shape than the away side, so take Maccabi FOX Tel Aviv at -5.5, at odds of 1.90. Anyone looking for the Over/Under market should go OVER 162.5 at odds of 1.90. Bet Now!